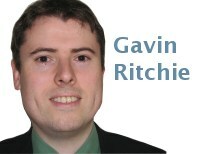 Given my birthplace, I have a more than casual interest in the causes of excess mortality experienced by Scots beyond that explicable by deprivation alone. 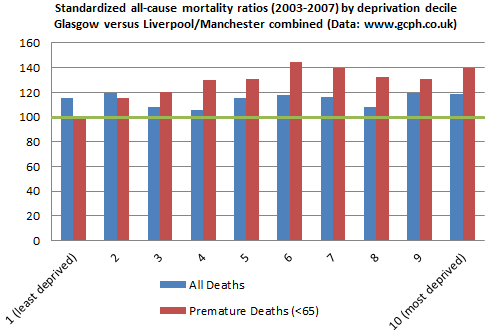 The phenomenon of a 30% excess in premature mortality and a 15% excess in general mortality appears most concentrated in the west of the country, to the extent of even being dubbed in some quarters the Glasgow effect. "The immediate causes are known: high rates of alcohol and drug-related deaths, suicide, violence, cardiovascular disease, stroke and cancer. But what are the underlying causes?" Many theories have been advanced for what those underlying causes might be, a large number to do with what might best be described as differences in the innate psychology of the cities - such as the sense of coherence, social capital, individual values such as hedonism, or even that well-known cause of excess dictionary-checking, anomie. Research to aid with determining precisely which of the most plausible mechanisms are causal has been ongoing and this summer saw the publication of the results from a three-city survey research project seeking to advance this understanding by questioning people in the cities from different levels in the social strata. Suffice to say, no obvious smoking guns were found, with the each city taking turns in top, bottom or middle positions of the various metrics. However, Glasgow did appear to score significantly lower in the areas of social capital, exemplified by activities such as volunteering, trust and reciprocity, and there also appeared to be some evidence of increased risk-taking. It can be hard to draw robust conclusions with such survey material however: one measure of social participation where Glasgow underperformed was taken from professed religious affiliation (as an imperfect proxy for religious participation). One problem is that in a city with a famously problematic religious divide some reluctance to disclose probably comes with the territory! In conclusion then, some tested hypotheses find support, whilst others recede, and hopefully these findings will continue to guide public health initiatives. A single "answer" remains unlikely, and clearly more work needs to be done, including in more physiological areas such as vitamin D deficiency. Depressingly (for me at any rate), research suggesting at least part of this excess mortality survives emigration may be evidence of a persistent early-life effect. This reminds me of something the guid people of Edinburgh always took pleasure in pointing out when I first settled here: you can take the boy out of the Glasgow, but you can't take Glasgow out of the boy. Ouch!